30 Mar 1942: A detachment with six squadron aircraft deployed to Natal, Brazil and operated from Parnamirin Field at Natal. The remaining six aircraft and crews operated from NAS Norfolk and, at various times, also had detachments at NAS Banana River, Fla., NAS Jacksonville, Fla., and NAS Charleston, S.C., to conduct convoy coverage and search operations under the operational control of FAW-5. 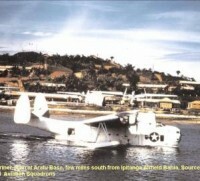 8 Jun 1942: The remaining squadron assets in the States deployed to Natal, Brazil and rejoined the other squadron detachment. 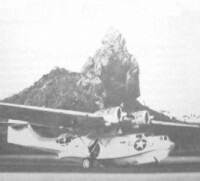 The squadron’s first fatalities occurred during the final leg of the flight to Brazil when Lieutenant (jg) C. H. Skidmore’s Catalina encountered a severe thunderstorm causing it to crash into the sea five miles northeast of Natal. Only three of the eight crewmen aboard were rescued. 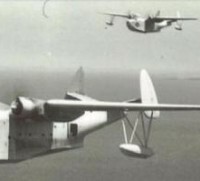 2 Jul 1942: VP-83 became operational at Natal, Brazil, and began combat patrols over shipping lanes along the Brazilian coastline from Rio to Cape Orange. 6 Jan 1943: Lieutenant W. Ford attacked a surfaced U-boat located 80 miles NE of Fortaleza, Brazil. The sinking was confirmed by rescued survivors as U-164, Korvettenkapitän Otto Fechner commanding. 13 Jan 1943: Lieutenant L. Ludwig attacked a surfaced U-boat off the coast of Brazil. The sinking was confirmed after the war as U-507, Korvettenkapitän-Harro Schacht commanding. This submarine’s activities at the start of the war were responsible for Brazil entering the war on the side of the Allies. 15 Apr 1943: Ensign T. E. Robertson and Lieutenant G. Bradford, Jr., attacked a surfaced submarine off the coast of Brazil. Ensign Robertson made the first bomb run, dropping four depth charges that damaged the boat. Lieutenant Bradford attacked minutes later with four more depth charges dropped from an altitude of 50 feet. The submarine sank six minutes later. Thirty survivors exited the boat and boarded three rafts. One raft was found 27 days later by Brazilian fishermen. It contained two bodies and one survivor who later confirmed the sinking of Archimede, a 913-ton Italian submarine. 1 May 1943: VP-83 returned to NAS Norfolk, Va. 1 May 1943: VP-83 returned to NAS Norfolk, Va. 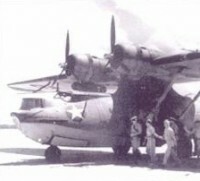 Shortly after its arrival, on 15 May 1943, the squadron was redesignated VB-107 and subsequently ended its career as a medium seaplane squadron.